Heat oven to 350°F. Gently fit 1 wonton skin into each of 36 small muffin cups, 1 3/4x1 inch, pressing against bottom and side. Bake 8 to 10 minutes or until light golden brown. Remove from pan; cool on wire rack. Mix remaining ingredients except sour cream and cilantro sprigs. Just before serving, spoon bean mixture into wonton cups. Top each with 1/2 teaspoon sour cream. Garnish each with cilantro sprig. Get a head start on your party by baking the wontons and making the filling 2 days before. 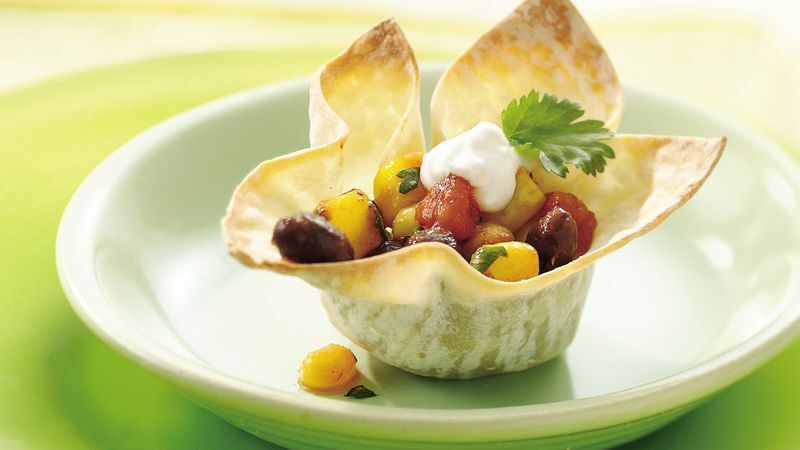 Fill and garnish wonton cups just before serving. Tie green onion strips into elegant “bows” around each cup to make guests feel extra special!